We all have that one person on our list who not only has everything she could need, but goes out and buys it for herself anyway. Before you panic, we have a couple of last minute stocking stuffer ideas that will help you cross that last one off your list. Sephora’s Pocket Brush Set $12: This mini brush set is a must-have for touch-ups and travel bags. It has all of your essential brushes and packs them into a silvery micro-clutch that fits in the palm of your hand. 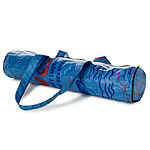 UnCommon Goods Recycled Yoga Bag $35: It’s a one-of-a-kind tote made from recycled rice bags. The proceeds from its sale benefit the disadvantaged works in Cambodia who made it so everybody can feel good. Aveda Rosemary Mint Bath Bar $12: This moisturizing bath bar is so luxurious it’ll transform her shower into the spa. Rosemary and mint fibers gently exfoliate and their delicious scent lingers.